The software version after this update will be 1.0.5, as shown in the bottom-right corner of the game's title screen. Bring your amiibo into the game as a powerful fighter that grows and evolves over time. amiibo you have trained in Super Smash Bros. for Wii U can be brought into Super Smash Bros. for Nintendo 3DS. Please note: To use amiibo on Nintendo 3DS, Nintendo 3DS XL and Nintendo 2DS systems, a separate accessory – currently scheduled for release later in 2015 – and separate software update will be required. Please stay tuned to the Nintendo website for more information. Please note: you can only post data you have created yourself, and uploaded content will be deleted from the server after 30 days. It's also possible to send snapshots, Replays, and Mii Fighters to your friends. 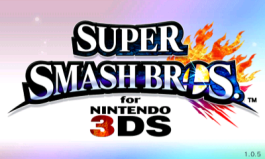 When connecting to the internet from Super Smash Bros. for Nintendo 3DS, the game will check for new data. Downloading received data may take some time. If you don't download data within 30 days, it will be deleted from the server. Please note: after updating to version 1.0.5, you will not be able to play local matches with players using version 1.0.4 or below. In addition, you will be unable to play Replays created in previous software versions. This update is also required in order to access online features of the software.